In the last months two institutions of the Council of Europe reported about the situation of refugees and asylum-seekers in Bulgaria. One report published in April 2018 by Ambassador Tomáš Boček, Special Representative of the Secretary General on migration and refugees, focuses on regular Push-Backs along the Bulgarian-Turkish border, the Bulgarian asylum system, the detention of those seeking protection, the situation of unaccompanied minors and the problems of integrating recognized refugees. The report, for example, mentions that asylum-seekers are being systematically detained in detention centers in Lyubimets and Busmantsi. One the one hand, they face a lack of knowledge regarding their rights. On the other hand, a translation deficit during the procedures of registration, interviews, court cases and signing of documents can be observed. Another report by the European Committee for the Prevention of Torture published in May 2018, describes limited access to medical care in the detention centers, such as gynecological and psychological treatment. In addition, nearly all types of medicine have to be paid by the detainees themselves. Both reports of the Council of Europe address ill-treatment by staff employed in the detention centers. These range from beatings to more subtle forms of disrespectful treatment. In May 2018, the Bulgarian Ministry of Interior banned the photographing of the fence on the Bulgarian-Turkish border. A member of the Bulgarian Socialist Party (BSP) has recently published photos proving the partly poor condition of the fence. So far, the Bulgarian government has spent about 85 million euros on the fence. Now, a 300 meter wide corridor in front of it had been declared a security zone. Permission to enter this zone must be requested from the Ministry of the Interior (MoI) and may only be possible accompanied by the Bulgarian border police. In Bulgaria, Frontex is running several operations and helps the Bulgarian MoI with the surveillance of the border: “The support is provided through Joint Operations Flexible Operational Activities and Focal Points at Bulgaria’s land borders with Turkey and Serbia as well as relevant air operations“. 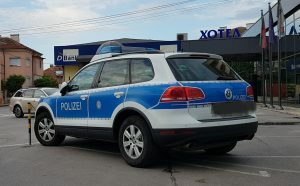 The Frontex operation at the Bulgarian-Turkish border is also supported by the German Federal Police (Bundespolizei). Meanwhile Turkish media reported that 44 “illegal migrants“ were push-backed by the Bulgarian border police in the Kofçaz district. It was reported that the migrants told Turkish soldiers that they had been had been beaten and had had their money and valuable possessions stolen by the Bulgarian police before they were pushed back by them to Turkey. Dieser Beitrag wurde unter Allgemein abgelegt und mit Detention, Detention Center, fence, FRONTEX, Push-Back verschlagwortet. Setze ein Lesezeichen auf den Permalink.